Raffles Medical Group has officially opened its first hospital in China in south-western Chongqing. 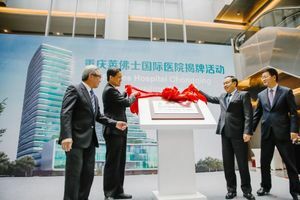 Touted as Singapore's first tertiary hospital in China, Raffles Hospital Chongqing is a 700-bed facility with a gross floor area of more than 100,000 sqm. The hospital, which is fully owned and operated by the Singapore healthcare player, comes as China promises to open up more sectors, including healthcare, to foreign investors. Other than targeting affluent locals and expatriates, Raffles Hospital Chongqing hopes to attract foreign patients. Executive Chairman Loo Choon Yong said that people go out of China for treatment, those who want to choose treatment in the West, but at the same time there are people in other countries, such as in Central Asia, who will go to Singapore to seek treatment. Dr Loo thinks many of these patients will choose to go to Chongqing in the future.